With this month’s revelation of a new famous and successful girlfriend, the world’s number one ranking, and a renewed Nike campaign, the platform for the restoration/rehabilitation of Tiger Woods appears to be nearly completed. The only piece left now is a win at the Masters in Augusta, Georgia next week. With a win, Tiger will be welcomed back to the talk shows and sports highlights for something other than the personal scandal that took an enormous toll on his professional life. All of which makes his new Nike campaign so fitting, if not mildly controversial. With the launch of the new Nike campaign, commentators are beginning to question whether or not “Winning takes care of everything” is an appropriate motto, especially for someone whose personal life was a mess- while he was winning. Each of us believes, implicitly or explicitly, that enough personal success will eventually spackle over the gaps in our true nature. We hope that at the end of our lives the good that we have accomplished will outweigh the bad so that in the final analysis we will be referred to as “a good person” by our many admirers. In order to validate these beliefs to our conscience, we rush to appoint “Messiahs” who begin as people, but ultimately become personalities for public consumption. We elevate people to levels of “complete heroism” for heroic deeds performed in one area of their life. If the successful area of their life provides significance or fortune for many, we tend to actively ignore or suppress inconvenient truths about the other aspects of their life. This was the historic pattern of hero-worship that played itself out during the Modern Age, and in the Information Age we’ve added a subtle nuance to our mythological quest for absolution. With the emergence of new media and tell-all reporting, it has become impossible to maintain the purity of our gods. Each of them eventually fall beneath the weight of our ambitious anxiety… because watching them fall and redeem themselves adds a compelling twist to the personal narrative we are also living out. The inconvenient truth in all of this isn’t that Tiger may have been a scoundrel, it’s that we couldn’t root for him as simply a golfer. We needed him to be more. We wanted Tiger to be a product that enhanced our self-actualization and when it became apparent that the product was defective, we didn’t just want our money back… We put him back at the bottom of the hill and gave him a bigger boulder to carry. If you doubt this consider that we’ve spent the last 4 years judging “the product” solely on the amount of wins that he’s produced, and now we want an older, more broken version of himself to resume his production for our entertainment. This is typical behavior for consumers. When an athlete wins, we choose to forget the affairs, and the drugs, the gambling, the cheating, and the arrests. “Winning takes care of everything” isn’t just a Tiger quote or a Nike slogan, it pretty much sums up the life perspective of our results-driven society. We aren’t so much concerned with how something gets done, we just want what we want, and we want it done in a way that is exciting, economical, and satisfying. If someone can deliver what we want, why in the world wouldn’t we want to root for that? Now that a pretty woman and the professional broadcasters are done punishing Tiger, why should we continue to… especially if he puts on a display of skill and determination that inspires us right? A win catapults him back into the category of “Hero”. What’s faulty with this way of thinking is the idea that we ever needed to punish Tiger for things that he never did to us, and that his success next week has anything to do with us. Whether or not Tiger can “come back” from his personal failures doesn’t truly register on our radar screens because we have no way of really determining it, and no desire to see him do anything other than succeed wildly or fail spectacularly on the golf course. 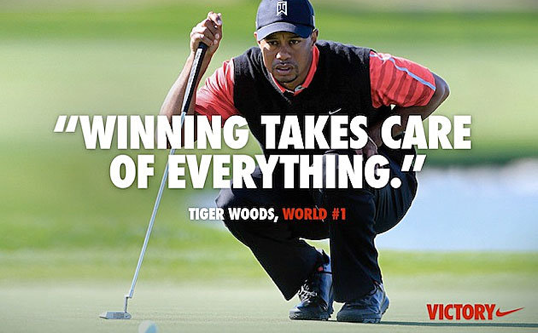 “Winning takes care of everything” isn’t just Tiger’s motto, it’s ours. Tiger only needs to win to prove that to us. Nike ought to be ashamed of themselves. I’m all for Tiger redeeming himself as a golfer and as a human being, I’m pulling for him. Nike isn’t doing him any favors with this campaign.